Orange County, California, sounds mighty inviting to corn, soybean and wheat growers who have been pushing, blowing and slipping on snow and ice for the past three months. Of course, the annual Commodity Classic is indoors at the Anaheim Convention Center. If you’re in town March 4-6, please protect yourself from excesses of sun, surf and shopping by stopping by booth #938, saying “Hi,” and checking out what’s new. Jill Appell, Altona, Illinois received the Illinois Pork Producers Association’s 2010 Distinguished Service Award. Jill has served as president of both the IPPA and National Pork Producers Council and continues to be active in many roles on the national level. Congratulations as well to Joe and Angela Mann, Cloverdale, Indiana for being recognized a runners-up in the Young Farmer and Rancher Achievement Award at the AFBF annual meeting in Seattle. This award is based on farm management skills and leadership activities. The Manns operate a 7,500 acre row crop 20,000 head-per-year wean-to-finish to finish operation with Joe’s brothers. Join us for these 1-hour free webinars beginning at 10:00 am CST. To register, e-mail norm@fbssystems.com by 9:00 am on the day of the webinar. Q. My Smart Feeder User-Defined Reports slow down as I go through the year. How can I speed them up? A. What you are experiencing is likely due to the processing overhead from the feed valuation routine that determines feed ingredient inventories and values for every day. This process is necessary to accurately calculate feed costs for farms that manufacture their own feed. If, however, your farm always buys loads of feed directly from a commercial mil (and you don't use a "grain bank" or internal feed inventories) you can bypass this step by always selecting the Feed Valuation Method option #2 (Value on Application) when running feeding reports. 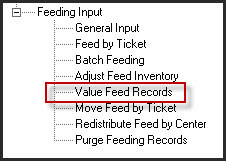 Even if your farm processes feed from inventories (your own feed mill or a grain bank) you can take advantage of this shortcut by going to Input General Feeding Value Feed Records. You'll need to do this once for every year that you'll be running feeding reports, and re-d0 this whenever you make any changes to feed entries within that calendar year. Cost of Production Calculation: Simple and Easy? Ok. I’ve got to react to a recent story in Farm Journal Top Producer, entitled “Simple and Easy,” which emphasizes the importance of knowing cost of production and margins (with which I heartily agree), but then proceeds to dispense fatally-flawed advice on how to go about doing this. Before I comment, I’d like to hear from our readers. Do you agree with the “simple and easy” solution prescribed by Top Producer? If not, where are they going astray? Version 8.1 upgrade CDs began shipping today. Normally, upgrade disks are mailed between October and December, based on service plans. The delay this year was the result of the virtual overnight transition from 32-bit to 64-bit computers in retail channels, requiring a major software re-write to achieve compatibility. Our original intentions were to complete a full .NET software conversion, but we have decided to wait until the next upgrade cycle to allow adequate time for additional capabilities and rigorous testing. Instead, we’re taking advantage of a built-in feature in Vista and Windows 7 that allows 32-bit emulation in a 64-bit environment (called WOW64). The good news is that Version 8.1 requires no data conversion, and since it’s been available through a web download since October, 2009, it’s been thoroughly field-tested. If you’re currently running a 32-bit operating system (nearly all XP, most Vista, and some Windows 7 computers) simply follow the default installation instructions included with the CD. If your computer was purchased recently, it’s likely 64-bit and you’ll need to follow the 64-bit instruction panel on the CD case. If you’re unsure of your computer’s architecture, check out the post below. To show our appreciation for our clients' patience and to celebrate our 30th year in business, we'll be distributing coupons with the 8.1 CDs that are good for $100 off all FBS modules purchased between now and March 15, 2010. Thank you for your understanding and patronage! Here are some helpful tips to determine if your computer has 32- or 64-bit architecture. If your computer is more than two years old, uses an XP (or older) operating system or is currently running FBS software version 8.0 (or older), then it's likely 32-bit. If you've never installed FBS software and the computer came with a Vista or Windows 7 operating system, then here's a quick way to verify whether its architecture is 32- or 64-bit. 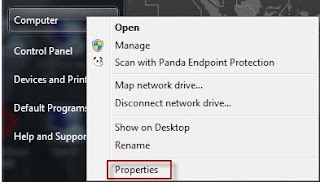 Press the Windows Start button, then right-click on the Computer menu item and select Properties. Here are typical system properties for a 32-bit computer. Here's what system properties look like for a 64-bit computer.